What the VISUAL and TEXT editors in Pressbooks do. How to use the visual and text editors. Ebooks are essentially websites, which means their formatting is accomplished with code–HTML and CSS primarily. You don’t have to see that code when you use Pressbooks, but you can. 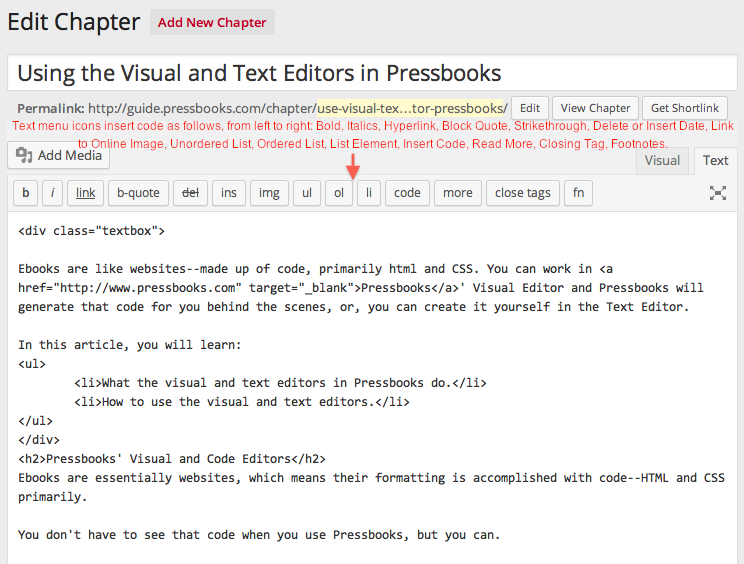 Pressbooks lets you use a VISUAL editor which automatically inserts the corresponding codes. Those who know HTML formatting may want to see or edit the code–that’s where Pressbooks’ TEXT editor comes in. As you’re editing a post, you can switch between the VISUAL and TEXT editors by clicking on “visual” or “text” in the top right corner. It’s always good practice to save your work before you switch. 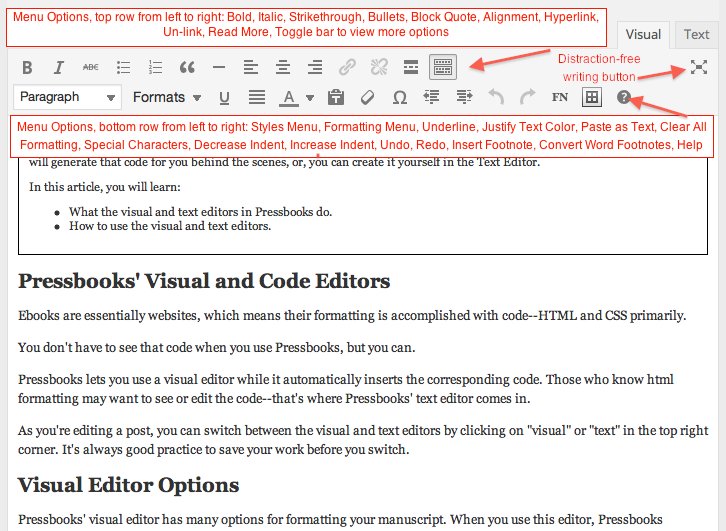 Pressbooks’ VISUAL editor has many options for formatting your manuscript. Click on the Toolbar Toggle to view all the formatting options available in the Visual editor. The bold, italic, strikethrough, underline, text color and alignment commands work just as you’d expect from a word processor. Use the styles and formats menus to highlight subheads or finesse paragraph indents, add textboxes and for adjusting tracking. Need to insert a special footnote? You can do that. You can even convert your footnotes from a Word document. In both the visual and text editors, you can use the “x” button at the top right for a distraction-free writing screen. Finally, you can always undo, redo or clear formatting entirely. After you’ve saved, check your formatting by clicking on View Post to see your chapter or part. If anything looks odd, you can see and adjust the code around it by going into the text editor. To investigate the underlying code might be causing a problem with your formatting. For people who want to code their formatting manually as they write. To insert some special formatting that must be hand-coded–tabular data, for instance. Here’s a quick tutorial on how to use the text editor to see, adjust and add to your book’s underlying code.